Anyone who has a roommate or a partner who snores can easily tell how huge a problem this is. For one, it makes it harder for you to fall asleep. Even when you’ve managed to go into a slumber, the quality of your sleep is compromised because of the noise it causes. Even the sleeper that does the snoring fails to get restful sleep due to this problem. So, what really causes snoring? Whether we snore or not, we sleep the same way as everyone else does. As you fall into deeper sleep, your muscles start to get comfortable and your throat becomes constricted. As you go into this stage, your breathing also becomes slower, more unperturbed, and steady. Snoring takes place when that level of deep sleep is reached. As you age, your throat’s muscle tone modifies, becoming a bit narrower in form. This causes obstruction in your airway that leads to snoring. In order to prevent age from negatively affecting your quality of sleep, stay away from too much alcohol, smoking, taking sleeping pills, and medications with adverse side effects. Otherwise, you get to be noisier in bed courtesy of your loud snoring as you naturally age. Being overweight is the most recognized reason as to why people snore. Being heavier means having thicker neck tissues that can cause injury on the throat. By sustaining a healthy weight through lifestyle changes helps you get rid of the extra tissue and frail muscle tone from your airway, which alleviates snoring. A lot of people who snore wouldn’t have guessed that their sleeping positions have something to do with their snoring. In reality, sleeping on your back can mainly contribute to your snoring problem. This is because sleeping on your back causes the throat and neck tissues to fall into relaxation that they usually would. This can lead to an immediate obstruction in the airway. To address this issue, teach yourself to sleep on your side. 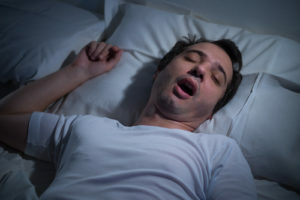 When you have congestion from allergies, sinus infections, or other nose problems, snoring can be an obvious effect due to the obstruction in the airways they’re capable of bringing. Men are more likely to snore because their airways in the throat are narrower. Snoring due to one’s anatomy can also be triggered by hereditary issues, such as a cleft palette and engorged adenoids. When the cause of one’s snoring is sleep apnea, it’s more serious than the usual causes. Typically, it is recognized for triggering severe bouts of wheezing and temporary choking during sleep. This can result to the sufferer waking briefly just to recover their breath. Simply put, sleep apnea means shallow breathing, which consists of irregular gaps. It is considered the most detrimental snoring issue due to the high risks it brings. If undiagnosed or ignored, sleep apnea can lead to serious medical conditions such as obesity, high blood pressure, heart attack, and stroke. There are other unusual causes of snoring, which includes certain medications. Alcohol intake before hitting the sack can also lead to muscle relaxation, which results to snoring. Smoking can also contribute to your snoring dilemma. The good news is that you don’t need to be stuck (or your sleeping mate) with your snoring issues. It can be addressed as long as the obstruction in the airway is identified. Even the most severe snoring problems can be treated or dealt with to lessen additional medical risks. It’s best to see your doctor in order to get a diagnosis, followed by precise treatment depending on said findings.